Where do migrating birds go? Do birds follow established migratory routes? How far do migrating birds travel? How fast do migrating birds fly? How high do migrating birds fly? What birds migrate during the day? What birds migrate at night? Do birds usually migrate in groups? How well can birds navigate? What do birds use for orientation and navigation? How do birds navigate at night? Do birds use landmarks to navigate? What external factors prepare birds to migrate? What external factors affect time of migration? Does the temperature affect migration? How does the weather affect migration? Why do birds fly to specific locations in the spring and fall? Are there any ecological implications with migration? How is migration coordinated with the seasons? How do human activities affect migratory birds? What are some human caused hazards for migrants? Do most migrants return after the winter? How does migration benefit birds and the environment? What are migratory bird treaties? How does migration affect the bird life of Texas? How are migratory birds important to man? Why is there an interest in migratory birds in Texas? What exactly is a Nearctic-Neotropical Migrant? Migration is the cyclic or periodic travel of an animal as it returns eventually to its original place of departure. Migration is often annual and is closely linked with the cyclic pattern of the seasons. It is most evident among birds, which have a highly efficient means for traveling swiftly over long distances. The migration of most birds is a yearly cycle. Not all birds migrate. The more severe the climate of an area, the greater percentage of nesting birds migrate. Two-thirds of bird species found in the United States migrate, some only short distances to more southern states. Those that do migrate have adaptations not seen in their non-migratory relatives. Migratory birds can build fat stores as an energy source for long flights. Migratory birds usually have longer, more pointed wings and weigh less than related non-migratory birds. There are a number of explanations for migration. (1) Birds migrate to areas where food is more abundant, (2) there is less competition for nesting space, (3) the climate is milder, or (4) the daylight hours are longer. These enhance the chances of survival of a bird and its brood. Most birds require a rich, abundant supply of food at frequent intervals because of their high metabolic rate. Adequate food is not available throughout the year in most regions. North American birds must endure the hazards of winter or migrate to more friendly climates. In winter they migrate to the warmer, southern regions of the United States, Caribbean, Mexico, Central America and South America where food is abundant. In the spring, these birds fly north to habitats where spring and summer provide more food production and less competition for food and nesting sites than in their winter habitat. Summertime at northern latitudes also means more daylight hours to seek food for themselves and their nestlings. Many nesting birds in Canada and the northern United States fly south to the tier of states along the Gulf of Mexico where the winter climate is more favorable and food is abundant. More than 300 species of birds that nest in the United States and Canada migrate to the West Indies or Central and South America. The principal wintering area for Neotropical Migrants extends through Mexico and Central America to Panama; it has the highest density of winter bird residents in the world. The migratory flights of many migrating birds follow specific routes, sometimes quite well-defined, over long distances. The shape of the continent determines the main routes of migration. These routes run north to south and include the Atlantic oceanic route, the Atlantic Flyway, the Mississippi Flyway, the Central Flyway, the Pacific Flyway, and the Pacific oceanic route (see Section 2). Geographic factors, ecological conditions and meteorological conditions determine such routes. The majority of migrants travels along broad airways within these flyways changing their flight direction in response to the direction and force of the wind. Some routes cross oceans or huge bodies of water. Some small songbirds migrate 500-600 miles across the Gulf of Mexico. Migration usually involves latitudinal or altitudinal travel. The distance may be a few miles or thousands of miles. In mountainous areas, birds, mammals and others move just a few miles from upper zones where they breed to the foothills or plains during seasons when the weather is severe and unfavorable. Clark's Nutcracker, for example, of the Rocky Mountains nests in the summer high in the mountains then winters in the lower forests. The Ruby-throated Hummingbird nests from the southern United States up into Canada and winters as far south as Panama. Some of these little birds fly nonstop across the Gulf of Mexico (up to 600 miles). Many flycatchers fly similar routes. Some birds, such as robins or grackles, winter in large flocks in the Gulf States. The seasonal flights of American wood warblers are spectacular. Some winter in the Gulf States and the West Indies; others fly as far south as Guyana, Brazil and Peru. Tanagers and Bobolinks migrate through the eastern United States, past Cuba to southern Brazil, Bolivia, and Argentina. The speed of flight depends largely on the species and the type of terrain covered. Birds fly faster when migrating than otherwise. Birds seem to fly faster in spring migration than in the fall. Migrants fly faster over water than over land. The American Golden-Plover may fly over 2400 miles south over the Atlantic Ocean at nearly 60 mph. Common Loons are among the fastest flyers at nearly 70 mph. Woodcocks on the other hand, fly at just over 10 miles per hour. Birds migrating over land may make stops for food and rest. Most migrants fly at low altitudes, usually below 7400 feet. Small birds migrating at night fly between 800-1600 feet. In the daytime they fly much lower, often below 200 feet. Some fly much higher, the record is held by the Bar-headed Goose: 29,500 feet above sea level, over the Himalayas in India. Swift, strong fliers and hunters are often daytime, or diurnal migrants. These include pelicans, herons, birds of prey, hummingbirds, swifts, swallows and finches. Some of these birds can feed on the wing. Nighttime or nocturnal migrants usually are birds that live in thick vegetation and rarely venture out of it. They include waterbirds, cuckoos, flycatchers, thrushes, warblers, orioles and buntings. Nighttime movement gives them protection from their diurnal predators. They feed and rest by day to build up energy stores for their long-distance flights at night. Most birds are gregarious during migration, even those that are usually solitary at other times such as insectivores and birds of prey. Birds, such as shorebirds and waterfowl, with similar habits often migrate together. Migrating flocks will often show remarkable cohesion. Traveling in large groups provides safety for individual birds by confusing predators and making it difficult to pick out a specific victim. A characteristic migratory formation is the 'V' of geese, ducks, pelicans, and cranes with the point turned in the direction of flight. Migrants often return to breed in the same locality where they were hatched. This journey may cover thousands of miles over many types of terrain and through extremes of weather. Birds show an amazing ability to orient themselves and home in on their destination. Migrating birds have many potential cues for orientation and navigation between summer and winter habitats. They do not depend on any single navigational cue. It has been demonstrated that birds use various guiding factors. These include topographic landmarks (mountains, valleys, rivers, coastlines), ecological factors (vegetation zones), and climatic changes (air masses differing in temperature and humidity). Birds have also demonstrated a compass sense. They are able to fly in a particular constant direction regardless of their starting point with respect to their destination. Birds have shown that they can relate a release point to their home area, determine which direction to take (orientation), then maintain that direction of flight (navigation). We presume this to be, in part, due to sensitivity to the intensity and direction of the earth's magnetic field. Migrant birds that travel at night use the stars to determine their bearings. In clear weather, captive migrants head immediately in the proper direction using only the stars. They can orient themselves correctly to the arrangement of night skies projected on the dome of a planetarium. Birds apparently can determine their longitude and latitude by the position of the stars. Evidence also indicates that the glare of the moon can interfere with this orientation. Many birds, especially diurnal migrants, can recognize the topography beneath them and can navigate using familiar landmarks. Some birds follow coastlines to avoid flying over large bodies of water. At times, many follow river valleys. River valleys are like highways offering direction and shelter and food when the birds land to rest. Some birds, such as hawks, that migrate by day concentrate along mountain ranges where they ride updrafts along the mountains. The same factors stimulate migration and reproduction. Before migration, metabolic changes occur. The thyroid gland controls these changes. Food consumption increases and fat accumulates under the skin tissues. This will provide the energy for long flights. The Ruby-throated Hummingbird stores enough fat to fly 26 hours non-stop at 25 miles an hour. This is enough to span the Gulf of Mexico. Variations in metabolism and related phenomena are controlled by another endocrine gland, the pituitary, located in the lower part of the brain. It sends out instructions by way of hormones. The pituitary is influenced by environmental factors such as day length and the intensity of the sun. The pituitary responds to increasing day length in springtime by accelerating the development of the gonads and all other metabolic processes, including the development of the thyroid, to prepare the bird for migration. If pituitary functions and variations in day length were the only factors, migration would occur regularly every year. Such a lack of flexibility could be catastrophic for migrants because of variations in biological and meteorological conditions. Environmental factors such as weather, arrival of spring, flowering, foliation, insect hatching and availability of food vary from year to year. The pituitary prepares the bird for migration. The proper ecological conditions are necessary to trigger it. Birds can be exhausted and emaciated by the time they reach stopping areas. They gorge themselves to replenish their fat reserves before preparing for the next leg of the flight. Weather and temperature are very important-the first cold front of the fall usually brings with it flocks of migrating geese. Many birds follow a temperature gradient as they return to nest in the spring. Birds vary in sensitivity toward temperature and other environmental conditions. Woodcocks and snipe rely on surrounding weather conditions to initiate their spring and fall migrations. The patterns of their flight depend on temperature and barometric pressure. Other birds such as swifts, swallows and orioles are less weather dependent and the dates of their departure and arrival occur with regularity each year (i.e., the swallows at Capistrano). Weather is one of the chief external influences on migration. Cool air masses moving south in the fall can trigger migratory flight. Cool air brings high pressure, low or falling temperatures and winds moving in the direction of flight and clear skies. If the cool air meets warmer air, clouds, precipitation and fog may result. Fog, especially, causes birds to descend to the ground and cease migration. Sudden changes in the weather can be disastrous for birds. In the spring a warm, moist mass of air (low pressure with higher or rising temperatures) moving north over the Gulf of Mexico can start a wave of migrating birds to move northward from the American Tropics or southern United States. A southward moving cold front meeting such a warm air mass can result in heavy rains and high winds. This can stop migration immediately or within 24 hours. These spring "fallouts" or "groundings" of migrants may occur when the migrating birds literally fall into sheltered areas seeking food and refuge. This can be disastrous if the migrants are forced down into the ocean drowning thousands of birds. Resumption of southerly winds and rising temperatures starts migration northward again. The roots of the migratory habits of modern birds are believed to date back millions of years, and were tempered by environmental changes caused by the Ice Ages of the Quaternary period over the last 2,500,000 years. Migration, as is known among modern birds, probably developed gradually by stages. As the environment changed, some animals changed their habitat slightly, hardly leaving their home region. The movements of others were more erratic, moving toward more favorable places. These first stages of migration were stabilized by natural selection. As winters grew more severe, much of a given bird population probably perished rather than attempting to flee any unfavorable conditions. A fraction of this population probably sought more favorable conditions elsewhere. Natural selection favored the 'migrants' and migratory tendencies were retained. In some cases, the original habitats were in present-day southern wintering areas. The birds developed a tendency to leave in spring to breed in territories to the north that were less crowded. Fall brought seasonal changes in weather and declining food supply in these newly settled regions. This forced the birds to migrate back to their former range for the winter. North American birds that originated in the tropics include hummingbirds, tyrant flycatchers, tanagers, wood warblers, orioles and swifts. In recent geological times these birds gradually spread northward as glacial ice receded and the continent became warmer. Other birds, such as plovers, ducks and geese, originally lived in what are now their northern breeding areas. Gradual climatic changes forced them to spend winters far to the south. Migrations appear to be the consequences of invasions or emigrations during which animals settle in new regions during part of the annual cycle, then return to the original region to complete the cycle. Migration patterns are not fixed. As climates change, migration routes change as well, causing birds to lengthen or shorten the routes or to abandon them altogether. There are many ecological implications of migration. The sequence of migratory movement is closely integrated with the annual cycle of ecosystems that are characterized by productivity fluctuations. The food resources of some regions could not be adequately exploited without bird populations moving. Migratory behavior occurs in species located at specific trophic levels where maximum fluctuation in food production occurs in both breeding and wintering regions. Many migrant birds avoid primary equatorial forests where productivity is usually constant throughout the year and food surpluses do not occur. They do, however, congregate in savannas where productivity varies with the seasons. A coordinated sequence is apparent in the case of birds migrating from the northern Arctic regions to tropical winter regions; both life zones show broad fluctuations in productivity. In the Arctic, vegetation and animal production are very high during the summer. Ducks and shorebirds nest there in great numbers, exploiting the food resources. As winter comes, days shorten and food becomes scarce. The waterbirds migrate to southern climates where the rainy season has caused food production to increase to optimal levels. In winter, ducks and shorebirds concentrate in the most favorable areas and remain until spring when productivity there is lowest. By then, conditions at the breeding areas are again favorable for the birds. The life cycle of these birds is closely attuned with the productivity cycles in their breeding and winter habitats. The size of populations is controlled by the capacity of both habitats to sustain them. 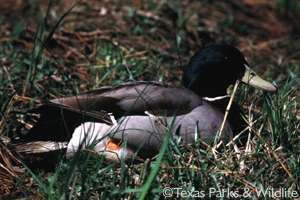 The winter habitat of the "Lesser" Snow Goose is in the southeastern quarter of Texas. Combinations of mild weather, ample winter food supply and protection on numerous wildlife refuges in its wintering range, as well as the bird's natural wariness, have led to a tripling of the snow goose population in the last decade. The summer nesting range around Hudson's Bay in Canada is being destroyed by overpopulation of geese. This may lead to a collapse of the habitat's ability to support the goose population. This can lead to a major die off and nesting failure of the geese and any associated wildlife in this area of Canada. Forest clearing for agriculture and petroleum exploration in Mexico and Central America has decreased the winter habitat of many migrant birds. The great fires of 1998 in Mexico will have, as yet, unknown effects on migrant birds. The fires have likely decreased forest habitat even further though. Migrants that returned that fall encountered decimated habitat and likely experienced a stressful winter resulting in fewer migrants returning the next spring. No one knows for sure. On the other hand, the fires created open areas that are the varied, transitional vegetation zones that many migrants prefer as habitat. Flying at night or in fog, many birds collide with tall structures. Lighthouses and skyscrapers are notorious killers of migrants. Reflective windows can be deadly. Birds see reflections of sky or trees and fly into them. Electronic towers for radio, television, cellular phones, etc. and their supporting cables kill thousands of migrating birds during migration. Habitat loss and degradation is a much greater problem. Habitat needed for food and shelter in winter is disappearing in Latin America. Clearing of forestland and plowing of grassland for crops destroys the diverse habitat that is necessary for many species of birds to survive. In the United States and Canada there is often not enough habitat for some species to raise their young. Where there is appropriate habitat, it may be too close to human disturbances or be too small an area. The populations of many North American bird species have decreased severely over the last 100 years. A serious man-caused hazard to migratory birds is pet cats. Free-roaming cats take a high toll on migratory birds. Scientific studies show that each year cats may kill hundreds of millions of migratory songbirds. Cats are serious threats to fledglings, birds roosting at night and birds on nests. An indoor cat is the best kind of cat. Many birds perish during migration and the winter season. It is believed that less than half the birds that leave the nesting grounds in fall migration will return the following spring. Migration over water is one of the most hazardous times for birds, especially small songbirds. Millions of migrating birds perish at sea. These are often young birds or birds that are blown off-shore or forced down by bad weather. Wildlife experts study waterfowl populations intensively to set hunting seasons and limits. They have a good idea of how many waterfowl head south each fall, about 100 million. About 40 million return; hunters kill about 20 million and about 40 million fall victim to predation, accidents, environmental factors and disease. Migration has considerable ecological significance. It enables fast-moving animals to exploit fluctuating resources and to settle in areas where they could not live if incapable of rapid travel. On the other hand, peaks of food production would be unexploited without the periodic presence of migratory populations. In 1918, the United States and Great Britain (for Canada) ratified the Migratory Bird Treaty that closed hunting for certain groups of birds that migrated across their mutual borders. Hunting was permanently closed on insectivorous birds and other non-game birds. Game birds (including ducks, geese and cranes) were given protection except for an annual hunting season that could not exceed three and a half months. Additional treaties were signed with Mexico (1936), Japan (1972), and the USSR (1976) protecting migrants between the United States and those countries. These treaties protect most naturally-occuring species, while most introduced species are not protected in the U.S. (e.g.,House Sparrow, European Starling and Rock Dove [feral pigeon]). The upper coast of Texas is in a truly unique position to observe migration. The state occurs directly in the center of the Central Flyway. Most birds that move along this route travel through Texas and eventually through the Upper Coast of Texas. Birds traveling the Atlantic Flyway during the fall reach the Florida panhandle, then may turn west and follow the Gulf Coast to Texas. Birds of the Mississippi Flyway follow that great river system to the Gulf then either cross it or turn west as well. The Pacific Flyway funnels birds between the Rocky Mountains and the Pacific Ocean. The Rockies end at Big Bend in Texas. Birds may be funneled to Big Bend where they can cross over the state and follow the Rio Grande or other watercourses to the Coast. Texas has recorded 615 species of birds, more than any other state. These are mostly migrant birds that have followed one or more of these flyways into our State. Migratory birds have considerable economic impact in North America. Since European settlers first came to the New World, they hunted various birds, such as ducks and geese, rails, doves and shorebirds, for food and sport. During the late 19th century, many species were hunted to near extinction for the market as food and feathers for adornment on women's hats. As their numbers dwindled, controls and seasons were instituted to stop their decline and stabilize the populations. Laws established to protect nongame birds and regulate hunting of game birds include the Migratory Bird Treaties mentioned above. Today, regulated hunting is a major industry in many areas of the United States. Most nongame birds were recognized to be welcome allies against insect pests. Most of the migratory birds of North America are insect eaters. Healthy, stable populations of these "songbirds" help to keep insect pests within tolerable limits. There are numerous instances where flocks of birds have descended on areas threatened with disastrous insect infestations and virtually eliminated the threat. All birds have increasing recreational value as birdwatching and other forms of nature related activities become more popular. Ecotourism, including birdwatching, camping, hiking, nature study and photography have become part of a multi-billion dollar industry. Throughout the United States, more people are engaged in nature tourism than either hunting or fishing. Together, hunting, fishing, and ecotourism are part of an industry that is worth over $100 billion annually in the United Sates alone. It pays in many ways to protect and maintain our natural assets. Of the 338 species that are listed as Nearctic-Neotropical migrants in North America (north of Mexico), 333 of them (or 98.5%) have been recorded in Texas. This means that of the 615 species of birds documented in Texas, 54% of them are Nearctic-Neotropical migratory birds. Texas is important to these migrants and these migrants are important to Texas. These species are collectively known by a host of other names. The species that comprise this group basically breed in temperate latitudes (i.e., U.S. and Canada), but leave for the winter for tropical latitudes farther south (i.e., Central and South America). Their migratory habits are part of their lives and heritage. *Common names follow the 7th edition of the AOU Checklist. Added modifiers in quotes represent distinct subspecies.